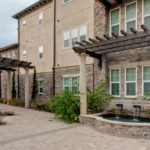 While college students generally used to prefer living alone while in school, over the past several years, University of Florida students are increasingly choosing to live in 4 bedroom apartments in Gainesville FL. There are many advantages to living with 3 other students: you get to live with friends, you get a lot more space, and rent is almost always cheaper, since you’re splitting it amongst four people. We know that because there are so many four bedroom apartment options in Gainesville it can be hard to choose which one is the best fit for you and your friends. 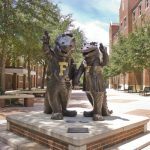 We’ve compiled a list of some of the most popular 4 bedroom apartments near the University of Florida campus to help you decide! Savion Park Luxury Apartments are ideal if you and your friends love the outdoors. 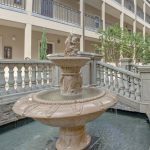 The property is located in a quiet neighborhood walking distance to campus and overlooks a serene pond with a fountain and lit jogging path. 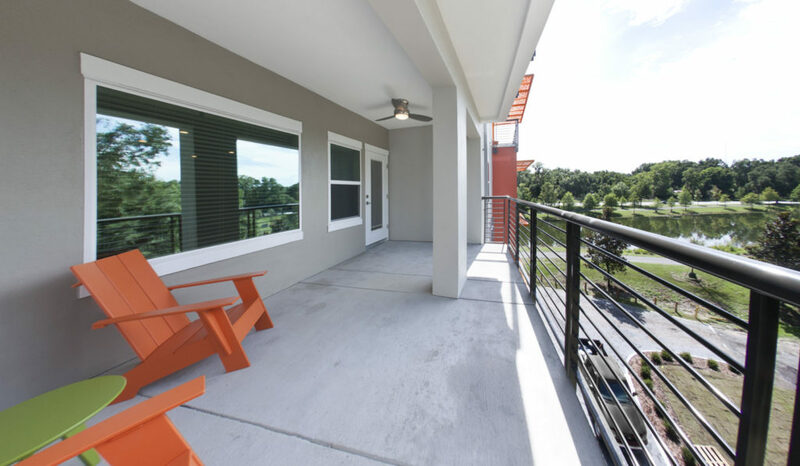 The four bedroom units come with extra large balconies (seriously — they’re HUGE), perfect for relaxing and drinking coffee before class and enjoying Gainesville’s natural beauty. 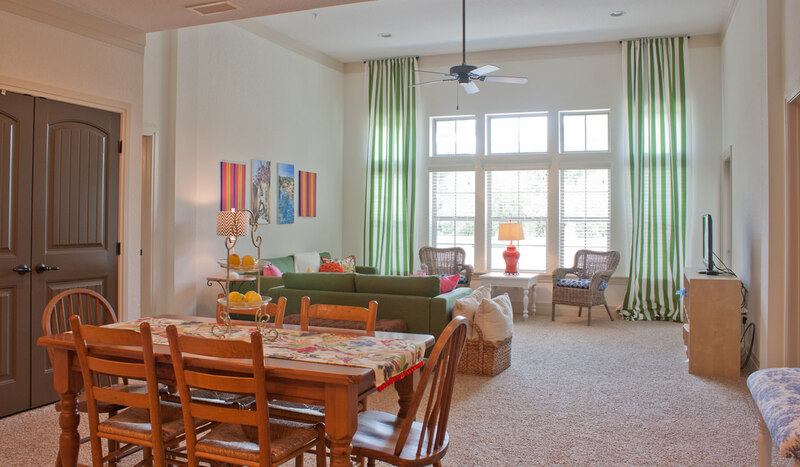 Solaria Luxury Apartments is a popular option for sorority women due to its close proximity to UF’s Sorority Row. It’s less than a 2 minute walk, making it convenient for girls to quickly and conveniently walk to meetings, meals and socials at their sorority house. Solaria is also super luxurious; granite countertops, luxury bathrooms and built-in wine racks are just some of the upscale amenities residents enjoy. Bougie! 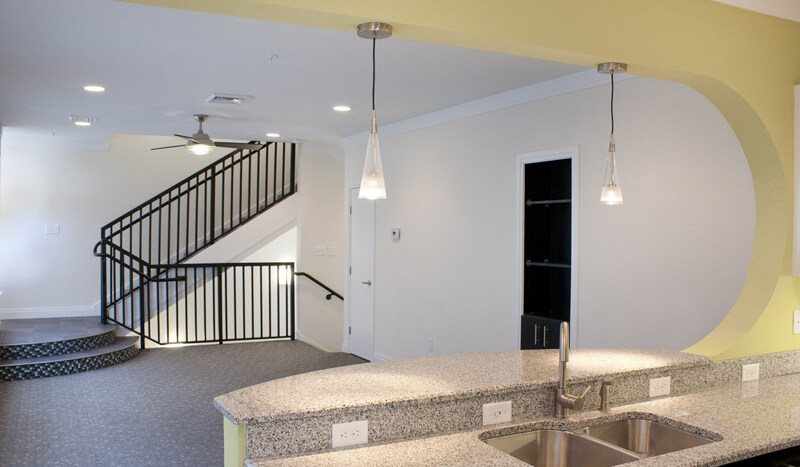 Deco ’39 Luxury Apartments brings vintage South Beach luxury to Gainesville! This 4-bedroom townhouse unit features art-deco-inspired design elements, such as walls with unique, intricate geometric shape cutouts, a modern kitchen with retro flair, and a ’60s style staircase linking its two floors. Plus, the apartment complex’s exterior lights up at night with colorful LED lights. Totally tubular. Let’s face it: juggling 4+ classes, involvement, friends and family gets hectic. 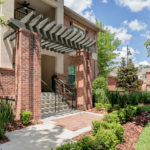 If you prefer the privacy and charm of a house but don’t want to have to deal with maintenance, this townhouse at Archstone Luxury Apartments is the best of both worlds. 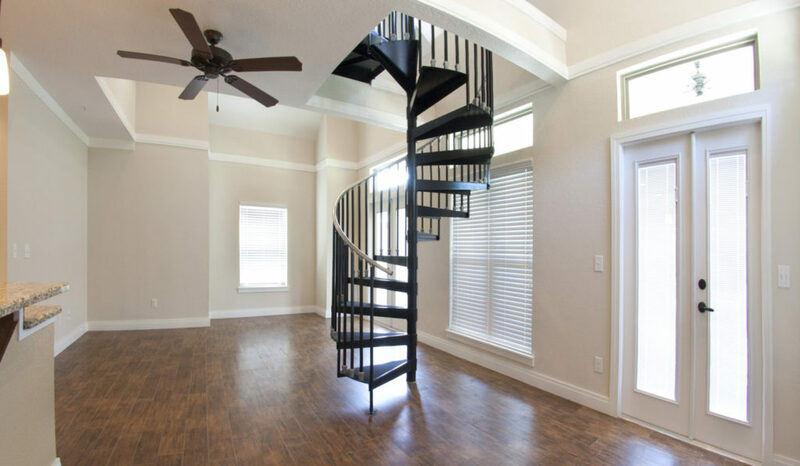 It’s about as big as a house and incorporates unique features such as a stunning spiral staircase connecting its two floors, but residents have all of their yard maintenance taken care of, and they are mostly separated from the rest of the apartment complex, meaning they get more privacy. So; which of these 4 bedroom apartments in Gainesville would you choose?